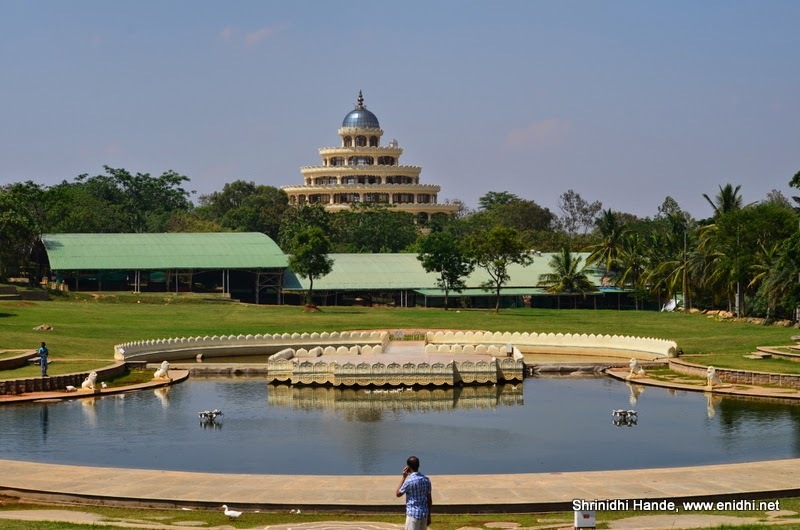 Vishalakshi Mantap or Mandir is the primary attraction at Art of Living’s Bengaluru campus, which is also its international headquarters. It is one of the tallest structures in the campus visible from distance. It is named so after Sri Sri’s mother. 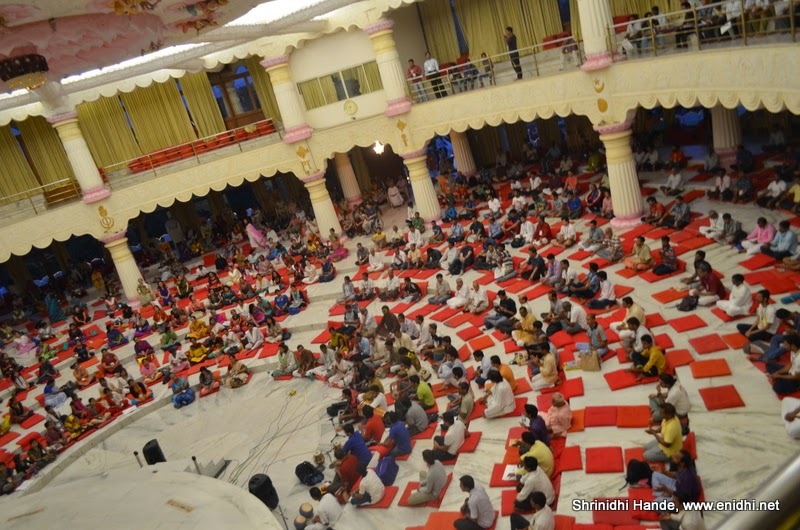 This circular shaped, 6 level multi –purpose hall is used for several activities throughout the day- mostly Yoga sessions in the morning and Satsang sessions in the evening. When Guruji is not present in person, his photo is kept at the centre. Hundreds of red coloured pillows are kept inside VM for the comfort of visitors. During my weekend stay, I visited VM multiple times. 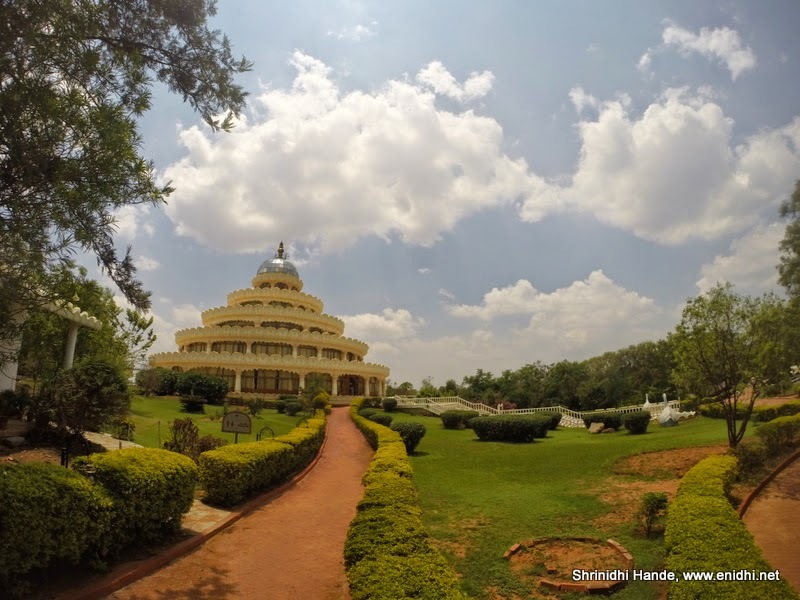 Vishalakshi Mantap (VM for short) has over 1000 petals in its circumference at various levels, has an all marble store and beautiful art work on the top. VM has all marble flooring and also carries symbols from various religions, indicating that structure is religion neutral and welcomes all. Intricate carvings on the doors are also worth taking a closer look. 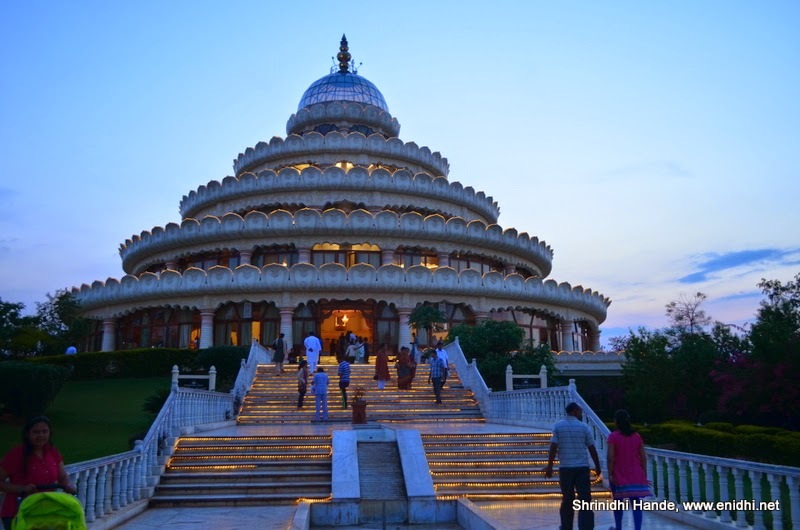 Couple of fountains decorate the path that leads to Vishalakshi Mandir and are turned on during evening, along with illumination that decorates the magnificent structure. If looked from top, this should look like a blooming lotus (if only I had a drone to get that shot). At the top most level, there is a Kalash housed in glass chamber, 15 ft high and reportedly tallest in Asia. Entry to this level is closed to visitors. The Satsang session was very interesting to observe. Men are required to take left half and women are required to move towards right half upon entrance. (Sat Sang means company of good people) While the core team selected the song and sung a line, everyone else sang with them in chorus, bringing in an aura of spirit to the whole atmosphere. At some high moments few energetic audience would even dance to the bhajans. This chorus bhajan can be heard from far away during Satsang. Lots of local villagers also attend Satsang. Guruji’s message is also played during Satsang. Satsang usually lasts for 90 minutes between 6.30 PM to 8PM. On Sunday’s it would start little earlier. Ashram’s shuttle services can be availed for elderly people from other parts of the campus. VM has a seating capacity for about 1000 people approximate. 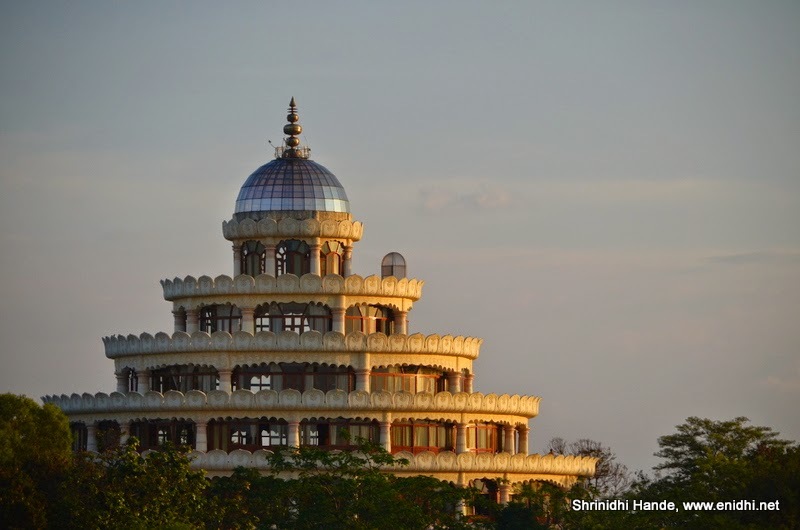 Below are a few photos of the beautifully designed structure of Vishalakshi Mantapam. Mobile photography is fine inside VM, but for use of professional camera, you might have to take permission from Ashram administration. When crowd is not much, it might be possible to go to level 1 terrace and enjoy a scenic view of the campus, or the sunset. I was suggested to keep my footwear at some distance from each other, as there have been instances of theft or visitors walking away with wrong pairs. Grand interiors and architectural design! Definitely worth a visit! Wow!! Beautiful .. great post. 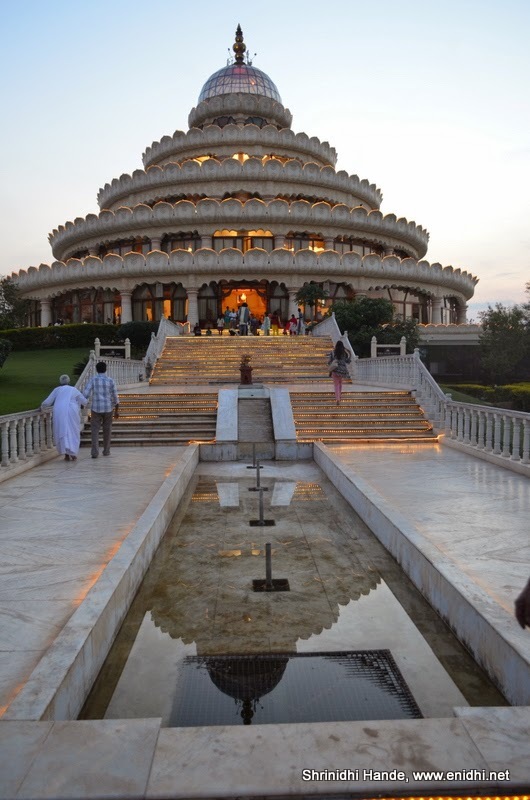 I have staying here for past 6 years but never looked at Ashram this way! Thanks for adding new perspective. Great!